So it’s full speed ahead. 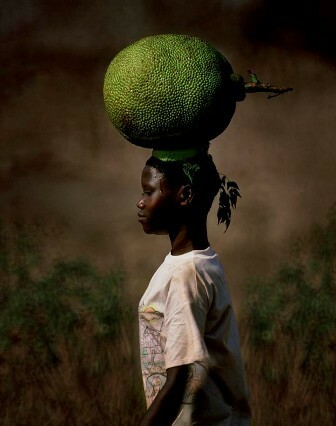 Talking of fruit, and heads, can you guess the fruit the young African girl above is carrying? By the time I get thoroughly used to being in Durban with its cold nights, cool morning seaside breezes and warm days, much like my home base Perth at present (we share the same latitude almost, and the same Indian Ocean), I’ll be in Johannesburg with its much lower temperatures. And then ‘bham!’, I’ll be back in Europe again with long hot Slovenian days, fresh warm Croatian seaside breezes, and balmy Italian nights.I’m just getting myself adjusted to being back in the Southern Hemisphere, and specifically African winter after European summer. Temperature changes, drastic sunrise and sunset differences and just different air and water all combine to put a lot of stress on the body when one travels. There is a saying in India (I think it is accredited to the sage Chanakya) that constant travelling ages one more than anything else. And that was written thousands of years ago when the fastest travel was on horseback. So what to speak of air travel and all its concomitant pressures on the subtle and gross body. Believe me, I’m not complaining. I am blessed to be able to travel and share my life and experience with others. The austerity of travel is well worth it if I can benefit people by my association and share my God-given talents to educate, entertain and uplift. And by doing so, my life becomes all the more rich in the process. By the way, if you’re waiting breathlessly to see how the little toast dialogue above connects with this blog entry, it really doesn’t. I just thought it was cute.